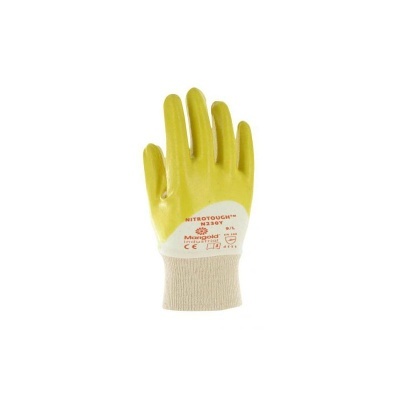 Featuring a 3/4 nitrile coating, the Marigold Industrial Nitrotough N230Y 3/4 Nitrile Coated Gloves offer excellent grip and abrasion resistance in the palm. Suitable for a range of applications, these gloves are particularly useful for oily and/or greasy environments where handling conditions may be difficult. The Nitrotough N230Y are designated Category II gloves, meaning they are suitable for medium-duty applications and intermediate levels of risk. The Nitrotough N230Y are available in five different sizes, meaning they should be suitable for most users. Please measure the circumference of your hand around the knuckles (excluding the thumb) with your hand open and your fingers together, and the length of your hand from the tip of your middle finger to your wrist.